It's the latest in a saga of continuing fallout from Trump's summit with Putin. After political backlash from Republicans and well as Democrats, the White House said Thursday President Donald Trump now "disagrees" with Russian President Vladimir Putin's proposal that Russian investigators be allowed to question Americans, including a former U.S. ambassador to Moscow. Putin had proposed the idea in exchange for allowing special counsel Robert Mueller's team to go to Russia to witness interrogations of 12 Russian military officers indicted in the U.S. -- what Trump then called "an incredible offer." Thursday's development marks the third time the president has walked back a statement he made at Monday's summit in Helsinki. “It is a proposal that was made in sincerity by President Putin, but President Trump disagrees with it," White House press secretary Sarah Sanders said in a statement Thursday. And in an apparent new twist, Sanders raised the prospect of Putin sending the accused Russians to the U.S, something Putin had nor publicly proposed at the summit news conference. "Hopefully President Putin will have the 12 identified Russians come to the United States to prove their innocence or guilt,” her statement continued. The latest Trump walk back came as the Senate was about to vote on a resolution barring U.S. diplomats from being questioned by foreign countries. It passed 98-0. Not long after Sanders issued her statement, she tweeted that Trump had asked National Security Adviser John Bolton to invite Putin to the U.S. this fall and that "discussions are underway." Sanders' statement Thursday stands in contrast to her response in Wednesday's press briefing, when she would not rule out the possibility that the U.S. could provide Russia access to a group of Americans they have accused of being involved in a criminal plot. Asked whether the president would actually entertain the idea of having U.S. persons questioned by Russia including former U.S. Ambassador to Russia Michael McFaul, Sanders said no agreement was made yet, but acknowledged that it was indeed a topic of the president's two-hour private meeting with Russian President Vladimir Putin in Helsinki. (Alexey Nikolsky/Sputnik/Kremlin/EPA/Rex/Shutterstock) President Donald Trump meets with Russian President Vladimir Putin at the Presidential Palace in Helsinki, Finland, July 16, 2018. In picture at left is seen US interpreter Marina Gross. 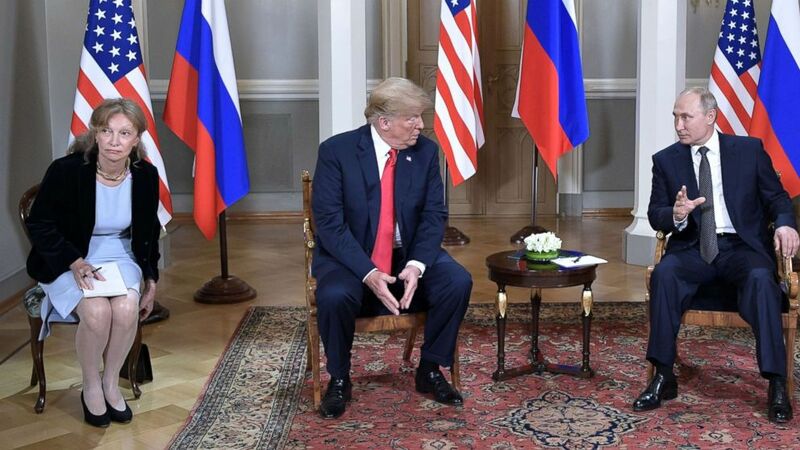 According to media reports, US opposition politicians are calling for Gross to be subpoenaed before Congress amid growing concerns on the controversial two-hour closed-door summit talks between Trump and Putin, in which only the two leaders' translators were present. "There was some conversation about it, but there wasn't a commitment made on behalf of the United States," Sanders said. "And the president will work with his team, and we'll let you know if there's an announcement on that front." However, State Department spokesperson Heather Nauert was soon after asked about Sanders' comment and shot down the “assertions by the Russian government” that it could question 11 American citizens as “absurd." Lawmakers and former intelligence officials have expressed outrage over the White House's previous suggestion that Putin's proposal from the Kremlin to potentially interrogate a group of Americans including a former U.S. ambassador was under consideration. Putin first raised the idea of the Kremlin being provided access to question U.S. citizens in his press conference alongside Trump, where he openly accused American-born British financier Bill Browder of funneling illegal donations to Hillary Clinton’s campaign. 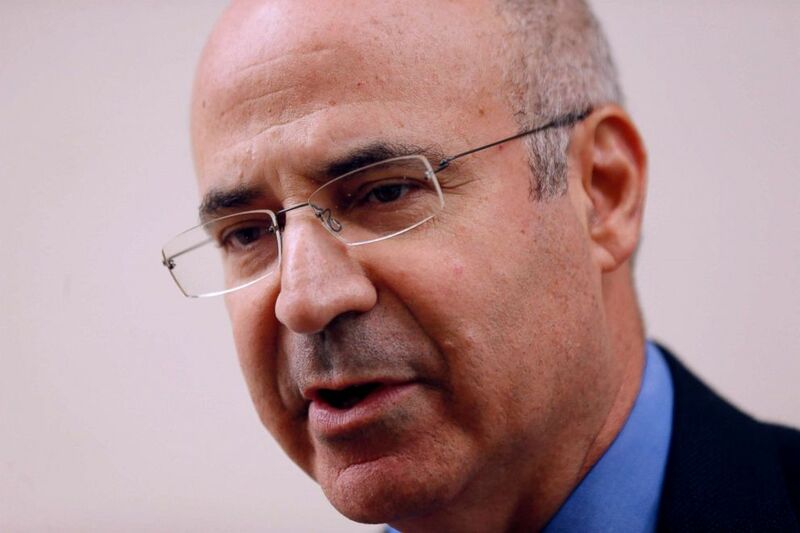 Browder is a long-time Putin critic and whistleblower on Russian tax fraud who is credited with helping push Congress to pass the 2012 Magnitsky Act that has resulted in sanctions against top members of Putin's inner circle. (Francisco Seco/AP) William Browder, a U.S-born Britain-based financier, talks to the Associated Press' reporters after leaving the anti-graft prosecutor's office in Madrid, May 30, 2018. Putin suggested in the Monday press conference that he would consider permitting Robert Mueller’s prosecutors in the Russia investigation to potentially interrogate the 12 Russian officials indicted last Friday for meddling in the 2016 election in exchange for Russia being able to question “some intelligence officers” who “accompanied and guided” Browder in his alleged transactions. The Kremlin later named former ambassador McFaul, among other Americans, as on their list of specific persons of interest. Lawmakers and former intelligence officials have so far been unsparing in their criticism of the idea. Rep. Eric Swalwell, D-Calif., the ranking member of the CIA Subcommittee for the House Permanent Select Committee on Intelligence, went as far to say that Trump could be impeached if he sought to hand over any U.S. citizens to Russia. House Minority Leader Nancy Pelosi similarly slammed President Trump for offering up U.S. diplomats for interviews with Russian investigators. A quintet of Democrats – Reps. Eliot Engel, Ranking Democrat of the House Committee on Foreign Affairs, Anna Eshoo of California, Gerald Connolly of Virginia, David Cicilline of Rhode Island and Gregory Meeks of New York -- wrote a letter to Trump on Thursday calling on him to reject Putin’s idea. Criticism was again not confined to Democrats. Sen. Marco Rubio, R-Fla., in a tweet called for the White House to "unequivocally rule it out." Speaking on Good Morning America Thursday, President Trump's former Homeland Security Advisor and ABC News contributor Tom Bossert said he agreed with critics who have called the idea "appalling."